Michael Romanov, the first czar elected by representatives of the people, took power in 1613 AD. Czar Michael made peace with Lithuania and Sweden, and managed to take control of Ukraine and Kiev away from Poland. During the 1650s, the czars conquered more and more of Central Asia until Russia reached all the way across Central Asia to the Pacific Ocean. The czars continued to get more power over the lords, and the lords in turn got more and more power over ordinary people, who were mostly farmers. People protested and rioted, but the czar’s armies crushed the protests. In 1676, Czar Alexei died, and his son became Czar Feodor. Feodor was only fifteen years old, and he was partly paralyzed, but he began work on reforming the government by making criminal penalties lighter and starting a university. When Feodor died at 21, he left no sons, so his oldest step-brother Peter became Czar. But Peter was only ten years old, and Feodor’s sister Sophia – Peter’s half-sister – ruled as regent. She was 25 years old. Sophia tried to conquer Manchuria in 1685, but Empress Xiaozhuang of China beat her off. 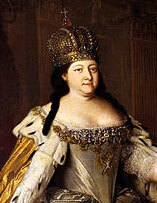 Peter’s allies forced Sophia into a convent in 1689, so then Peter’s mother Natasha ruled. 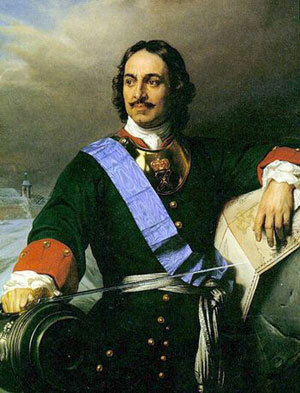 When Peter grew up, he first captured Ukraine from the Ottomans to his south, then expanded Russia to the north, where he defeated Poland, Lithuania and Sweden and built the city of St. Petersburg so his trading ships could sail across the North Sea. Peter also built up alliances in Europe. In 1717, Peter traveled to France to meet Philippe d’Orleans, the Regent there. Like Louis XIV in Europe and the Yongzheng Emperor in China at this time, and like all the czars before him, Peter gathered even more power into his own hands, and left less power for the people and the lords. 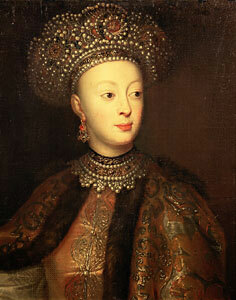 After Peter died in 1725, women ruled Russia again for quite some time. Peter’s wife Catherine took over for three years, though the Russian lords really had more power. When Catherine died, their grandson Peter ruled for two years, then their niece Anna ruled for ten years (1730-1740). Like the lords of England under Cromwell earlier, and the lords of France under Louis XV at the same time, the Russian lords tried to get control of Anna by making her agree to a constitutional monarchy, but Anna had the imperial guard, the secret police, and the less powerful lords on her side, and she kept most of the power. Anna used her power to take over more of Central Asia, and to take some land from the Ottoman Empire to her south as well. Anna tried to leave her power to her grandnephew and his mother, but soon after Anna died Peter the Great’s daughter Elizabeth took power instead (just as Maria Theresa ruled Austria). Elizabeth established the first universities in Russia. She also refused to execute even one person during her reign, which lasted for 21 years. Elizabeth succeeded in joining with France and Austria to crush Prussia in 1759. Elizabeth left the throne to her nephew Peter and his wife Catherine II, but Catherine soon killed Peter and ruled on her own. In successful battles with the Ottoman Empire, Catherine took over some Ottoman land around the Black Sea. This gave Russian shipping better access to the Black Sea and through the Hellespont to the Mediterranean. In the north, Catherine succeeded in getting control of Lithuania. To the east, Catherine crossed the Bering Strait and began to colonize Alaska, getting a Russian foothold in North America. But the Russian government continued to get most of its soldiers and money from poor farmers who had no rights. The American Revolution and then the French Revolution inspired the farmers to rebel and try to get free, but (in spite of Catherine’s interest in Voltaire) Catherine’s soldiers defeated the rebellion. 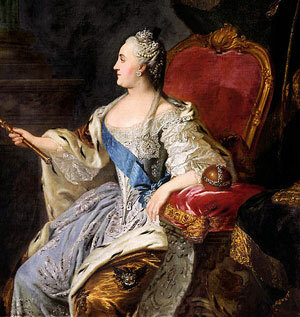 Between when Catherine I got power and the death of Catherine the Great in 1796, women ruled Russia for three quarters of a century. Cite this page: Carr, K.E. Peter and Catherine – Russian History. Quatr.us Study Guides, May 30, 2017. Web. April 23, 2019.